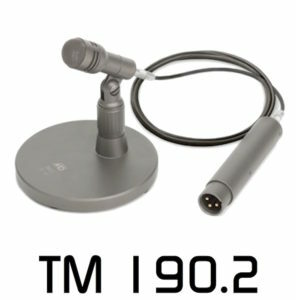 The TM 190.2 desktop microphone is a compact version of Studio condenser microphones series micon. It is specially designed for commentary, translators and applications in TV and Radio. It is a classic 48V phantom powered condenser microphone design, which ensures a high degree of speech intelligibility even in unfavourable acoustic conditions. Its unobstructive appearance also makes it ideal for use on conference tables. The TM 190.2 consist of the Desktop Microphone Capsule TMK 190 K, the Desktop Microphone Base Seat MF 90 and the Desktop Microphone Preamlifier BMV 190. 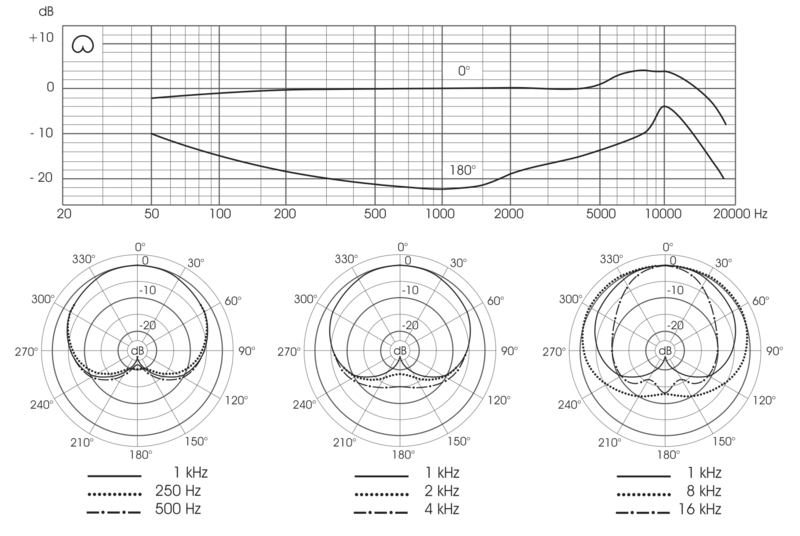 Use of a special capsule with a cardioidcharacteristic achieves excellent suppression of undesired acoustic sound level in the vicinity. The substantial metal Base Seat of the MF 90 provides a good slide-resistant base, and the micro- phone holder provides comprehensive angular adjustment of the microphone. The body of Capsule is small so it only take up small space in the TV view. The microphone has a balanced frequency response ensuring a neutral sound. A low output ́ impedance allows XLR-cable extensions. The microphone capsules are interchangeable via LEMO® connector. The capsule should first be fixed to the metal foot MF 90. 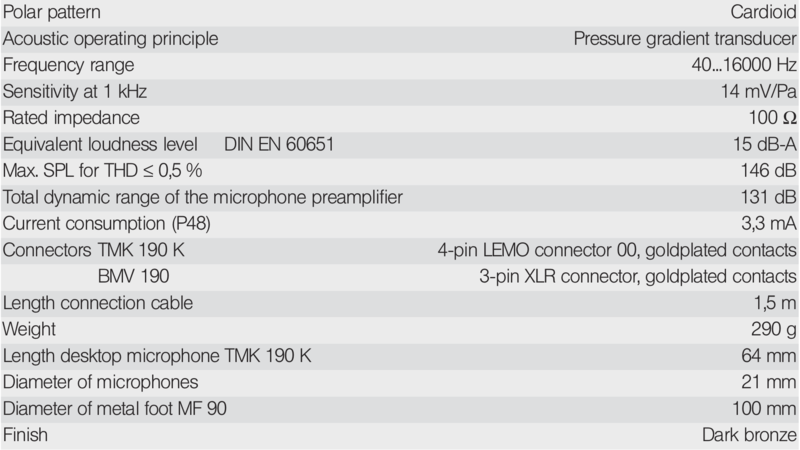 After fitting the capsule, the cable should be connected to the BMV 190 pre-amplifier and the 48 V phantom power can be applied via the 3 pin XLR connector. When necessary, the use of the W 19 windscreen is recommended.